This story originally appeared in the November 12, 2005 edition of the South China Morning Post (subscription only). While some 2,000 golf fans weathered rainstorms to track every move of the world’s best golfer Friday in the second round of the HSBC Champions tournament in Shanghai, Yao Guang Mei swept leaves with a bamboo broom. 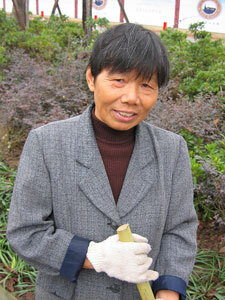 She just might have been the only person at Sheshan International Golf Club who had never heard of Tiger Woods. “All I know is that foreigners will come here to compete,” she said. Yao, who lives in a village 30 minutes away from the course, gets paid five dollars a day to work at the club, where a lifetime membership costs $148,000 and furnished villas average $2 million. And she’s happy to do it. Golf has a long way to go before it sheds its reputation of being an elitist sport in China — because it still is an elitist sport in China. And since courses are often built in poor, rural areas, luxury homes can sit across a creek from shantytowns. Two very different worlds collide. Tournament passes for the HSBC Champions cost RMB 2,000. That’s more than the average Shanghainese family makes in a month. A couple hundred meters beyond Gu, not too far from one of the parking lots for the tournament, 20-year old Yang Gui Lin sat on a small bridge and fished with a bamboo pole. The migrant worker from faraway Sichuan province normally would have been working at a nearby door and window factory, but he and all his coworkers were given two weeks off — unpaid — because of the golf tournament. Filed under Blog. Tagged china, danwashburn, golf, hsbcchampions, scmp, stories, tigerwoods, tournaments.